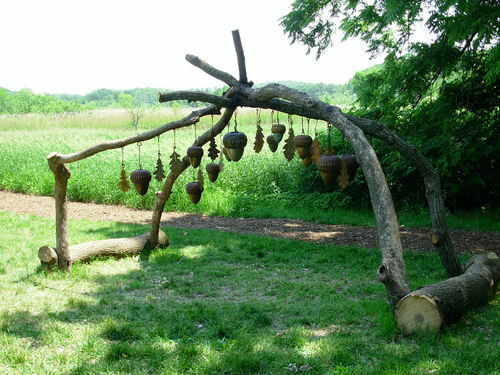 Sculpture being exhibited as part of the Art To A-Maze at the Minnesota Landscape Arboretum in Chaska, MN. Beneath the cast bronze acorns and the cut steel oak leaves, a visitor may experience the music the Arch makes when the wind blows. On a calm day, one may use a small stick or stone, striking each acorn "bell" playing his own composition. Ranging in size from 8" to 18", the variously patinaed 12 hollow acorns form their own arch, hanging alternately with 15 cut steel leaves. The leaves are naturally rusted and painted to reflect the autumn hues of the majestic white oak trees that grow on our property in Lakeville.